This cheesy bread becomes the perfect sidekick for nearly any soup. Preheat oven to 325°. 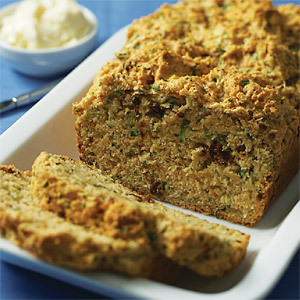 Coat a 4 1/2 x 8 1/2-inch loaf pan with nonstick spray. Blend flour, baking powder, salt, baking soda, oregano, and pepper flakes in a large bowl. Add zucchini, chives, Asiago, and parsley; toss to combine. Whisk together buttermilk, eggs, and oil in a second bowl, then fold into zucchini mixture just until moistened. Pour batter into prepared pan and bake until a toothpick inserted in the center comes out clean, 50–55 minutes. Cool bread 10 minutes, turn out of pan, and let cool on a rack 20 minutes before slicing.